The BMO Harris Bradley Center’s summer and fall schedules are modest this year compared to most around this time. Only four events are planned through the end of 2013 currently, though more are likely to be added throughout the remainder of the season. But, despite the sparse line-up, a few of the acts coming to the downtown Milwaukee arena are sure to be sell-outs. The Danceworks Mad Hot Ballroom and Tap Competition will roll into the Bradley Center on May 18. Hosting their seventh annual tournament at the venue, Danceworks is a city-wide initiative to get underprivileged youth involved in art and physical activity. The non-profit works directly with Milwaukee Public Schools during the school year, and many of the competitors in the event were first introduced to dance through the various school programs. The 2013 Danceworks Mad Hot Ballroom and Tap Competition is free and open to the public. Over 2,500 participants are signed-up to take-part this year, one of the largest groups in the history of the event, accomplished with the help of a new partnership with Milwaukee County Transit. 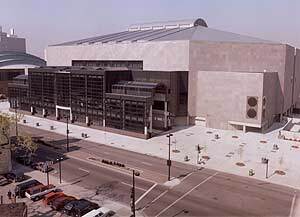 Free bus rides to and from the Bradley Center will be available on the day of the competition, and Goodwill plans to provide dance-appropriate clothing for children at the event. Doors open at 10AM on Saturday, May 18th. The ever-popular Ultimate Fighting Championship series returns tothe Bradley Center in August. Dubbed UFC 164, the August 31st fights will be the first in Milwaukee since Dan Hardy and Chris Lytle headlined UFC on Versus 5 at the Bradley Center in 2011. UFC 164’s featured fighters have not been announced yet. Harley-Davidson will be the premier sponsor of this year’s event. The Milwaukee-based motorcycle manufacturer will celebrate its 110th anniversary as part of the UFC’s Hometown Throwdown series, which honors long-time American companies by scheduling fights in their home cities. For its part, Harley-Davidson is offering fans the chance to win a custom designed “Street-Bob” motorcycle that will be introduced in the center of the main stage on the day of the event. Scheduled to round-out the 2013 season are pair of iconic acts that will come to the Bradley Center in September and November, respectively. County Music Award winner and pop-sensation Blake Shelton will bring his Ten Times Crazier Tour to the Bradley Center on September 13th. The second nation-wide tour in as many years for the accomplished vocalist, Shelton is coming-off of three consecutive Male Vocalist of the Year awards from the CMA, as well as the 2012 Entertainer of the Year title. His current tour will promote his new album, Based on a True Story, which has garnered unanimous praise from critics and fans, as well as two hit singles that have reigned at the top of charts for weeks. Fellow country-starts Jana Kramer and Easton Corbin will join Shelton on his Milwaukee stop. P!nk’s The Truth About Love tour was not originally scheduled for a show at the Bradley Center this year, though popular-demand has forced the decade-long superstar to extend the tour of her seventh album. Included in that extension will be a November 1st stop in Milwaukee, a show that is already selling tickets quicker than almost any other event at the Bradley Center this year. Acclaim for the tour has been ample in reviews throughout its run thus-far, especially for director Baz Halpin’s visual accompaniment to P!nk’s stellar voice range and physicality during her performances. Who Did The Packers Pick In The 2013 NFL Draft?